The possibilities are endless in Dr. Seuss's classic Beginner Book! 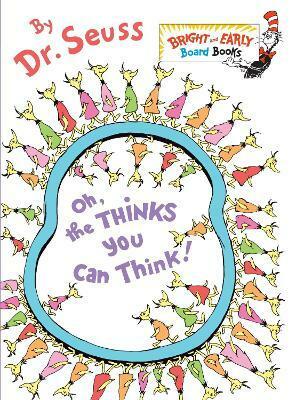 Young readers will delight in Oh, the Thinks You Can Think! which celebrates the imagination and encourages young readers to think . . . about thinking! "Think left and think right and think low and think high. Oh, the Thinks you can think up if only you try." Originally created by Dr. Seuss, Beginner Books encourage children to read all by themselves, with simple words and illustrations that give clues to their meaning. "Contains one of Dr. Seuss's solid-gold morals, the joy of letting one's imagination rip." --The New York Times. Theodor Seuss Geisel--aka Dr. Seuss--is, quite simply, one of the most beloved children's book authors of all time. The forty-four books he wrote and illustrated under the name Dr. Seuss (and others that he wrote but did not illustrate, including some under the pseudonyms Theo. LeSieg and Rosetta Stone) have been translated into thirty languages. Hundreds of millions of copies have found their way into homes and hearts around the world. Dr. Seuss's long list of awards includes Caldecott Honors for McElligot's Pool, If I Ran the Zoo, and Bartholomew and the Oobleck; the Pulitzer Prize; and eight honorary doctorates. Works based on his original stories have won three Oscars, three Emmys, three Grammys, and a Peabody. From the Hardcover edition.